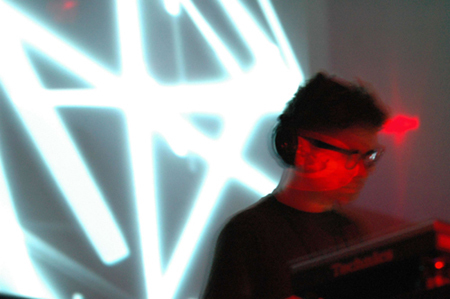 Sonar is the multimedia festival held in Barcelona, Spain every year. 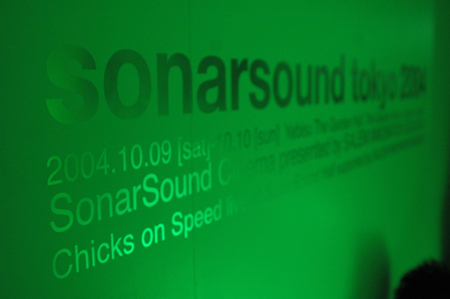 Sonarsoundtokyo has been held as a satellite event of the Sonar every year since 2000. 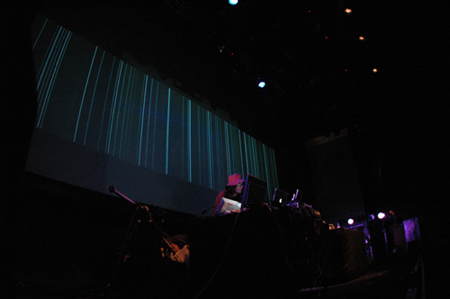 This year was not an exception, including enriching visuals not the music, Sonarsound Tokyo was held for two days of October 9th and 10th at Ebisu Garden Place. 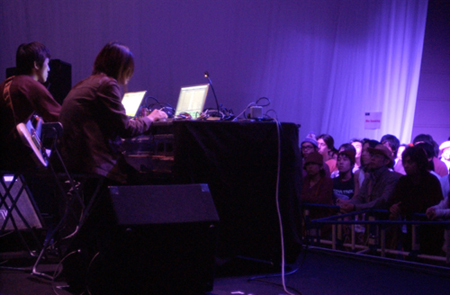 This is the story of two days of meeting of music, technology and people. On the first day, we saw one of the biggest typhoon in our history in Tokyo and worried about the event’s opening. However, in the front of the entrance, there was a long queue and the crowd was trying to get tickets sold on the day. The sight of the entrance showed me the expectation and excitement to this festival. I finally got through the chaos. Inside was also filled with people and I hesitated over to which way I should go. 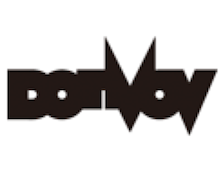 This year’s sonarsound tokyo has several venues; SonarSound Hall where live and DJ sessions was held, SonarSound Lab and SonarSound Cinema where short films and music clips from around the world. I went to “SonarSound Hall” at the first. The space was quite large and KARAFUTO was DJing on the stage. 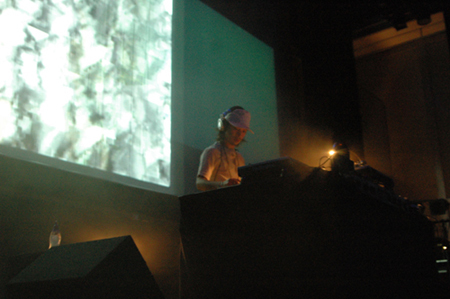 This venue was the main stage of this event and selected artists under the theme of “Advanced Music” showed club style DJing, using live and visual performance. Even the time was around 10 pm, 70 percent of the large hall was filled with audience, which was unusual for an overnight event. On the programme schedule, Rei Harakami was supposed to follow KARAUFUTO. He was one of the artist I really wanted to see. I dropped in “SonarSound Lab” just before the time of Rei Harakami going through the passages like a maze. Lab’s size was about one thirds of Hall and this place also show progressive artist under the same theme as the Hall’s. 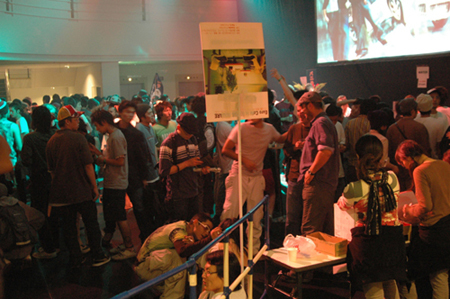 In front of “SonarSound Lab”, there was a section named as “Technology Showcase” where there were various instruments and music software company booths. 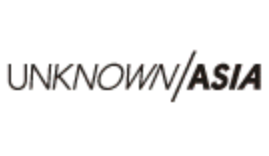 Here people can experience the new technology which is indispensable for electronic music. I dropped in the booth of “High Resolution”. The demonstrator there was a friend of mine coincidently, and I played with the famous software for artists called “LIVE4” and the latest mixer of Allen & Heath. I had been interested in this mixer because the techno-god Richie Hawtin use this same software, it was actually fun. Software and the mixer is linked and you can even control the filter on computer. Technically it’s not so unusual because there’s USB-MIDI controller now but the design is great and it’s very exciting to control. Recently, there’s some DJs who play with an iPod so it would be more fun if it could control iPod as well. Just before the time of Rei Harakami’s performance, I got back to the hall but what I heard was house music which was different from Rei Harakami’s jazzy and beautiful electronica. When I saw the stage from the distance, the DJ seemed to be Akufen. My heart quite failed me because Akufen was supposed to perform after Rei Harakami, I thought I missed his stage. Akufen is a leading artist of click house from Canada. His DJing didn’t seem to be in good condition. That might be because Akufen’s performance was forced to be brought forward, I found out later that Rei Harakami couldn’t make it on time due to the traffic problem by the serious typhoon. Then, Rei Harakami appeared. 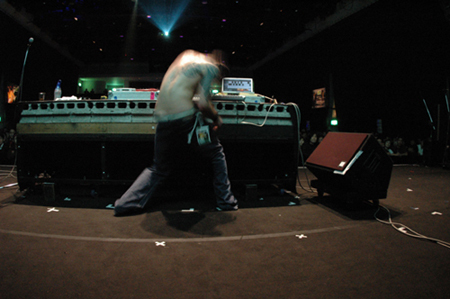 Visual by Shiro Takatani from Dump Type and the electronic music which wraps the hall was magnificent. Especially, visual by Shiro Takatani was not like the ones used in usual VJing, it’s quiet and very organic synchronising perfectly with music. After the Rei Harakami’s performance, I moved to “SonarSound Cinema” which was focused as another theme of sonarsound tokyo. “The Three Ages” by Jeff Mills was been screening at that time. The work is the experimentation that Jeff Mills put sounds on a silent film by Buster Keaton. In the discussion after the screening, he told that he would like to control the balance of mixing between visual and sound by changing the volume of music, not by the tone of music or composition. I spent rich time here not only with Jeff Mill’s work but also with enjoying quality visual and music in the theater at midnight away from the noise at the main hall. There was a bar in front of the main hall and of course there it was filled with the audience and even artists who were performers sometime. I found Ceephax Acid Crew, who is a younger brother of Squeare Pusher walking around with three cans of beer in his hand. When I talked to him, he casually replied me. 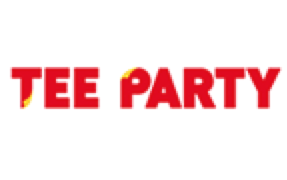 This openness is one of the best point of this event, without too much security. The rest of the first night was kept lively with Chicks on Speed, Juan Atkins and Carl Craig. The second day’s schedule was from the early evening to midnight. Different from the first day, the atmosphere of the venue was more relaxed. At the main hall, the first half was upbeat music and the latter half was a more electronic sound. The best artist in the first half was, as I thought, T.Raumschmiere. There’s not so many artists who are able to express the fusion of punk rock and electronic music in such a radical way. He showed the performance full of destructive and positive message. However, as usual, most excited person in the venue was himself. The artist whom I can’t finish this report without mentioning is Human Audio Sponge who performed the very last of this festival. Human Audio Sponge consists of Haruomi Hosono, Yukihiro Takahashi and Ryuichi Sakamoto. Three of them used to work under the name of YMO, who influenced a lot in the world electronic music scene. 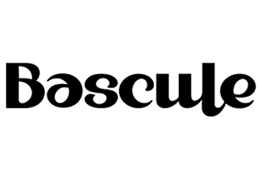 Although many famous music group have reorganised and kept playing their traditional sound, they changed their name and sound style, exploring new style of music flexibly. In the middle of the performance, they invited Keigo Oyamada aka Cornelius, then played onetime famous music in electronica version. There were so many people in the hall that a lot of people had to give up seeing their performance. 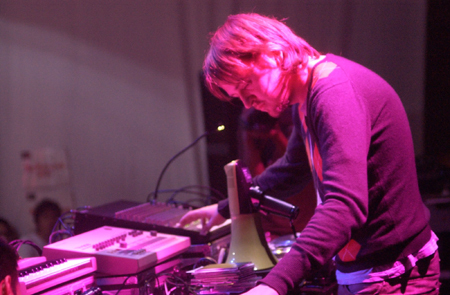 At SonarSound Lab, their performance was broadcasted live for those people. When I was watching Ryuichi Sakamoto played keyboard, Yukihiro Takahashi did drums and Haruomi Hosono did base, I imagined Egyptian pyramid which was brought back fully equipped with high technology. What I was most surprised of in the event was that a large number of people understood and enjoyed this particular music. It was like a miraculous experience to share the music with so many people, because the music are sometimes too experimental and difficult to understand.